Last night I released a new library to GitHub and npm called React PouchDB components. I’m excited to share this library, which started as an experiment to illustrate to my friend Jon how easy it could be to leverage PouchDB in React. After enough tooling around I suspected that the pieces could be extracted and shared more broadly. There are a number of different ways to deal with state in React, everything from the simple setState() to redux. Most sites need remote data, and so as a developer your options become a little more complex, leveraging promises inside of componentDidMount() or tools like redux-thunk. These are all great, but what I wanted was a simple way to fetch data into PouchDB and for it to be declarative. There are two components here, the first <MyComponent /> is a simple view, it renders some properties that are passed to it. The other is <App /> which declaratively establishes a PouchDB database connection using the <Database /> component. This component can take an optional name and remote URL for syncing. The <App /> component also uses the <Document /> component which is responsible for fetching data out of a PouchDB document and setting it as properties on <MyComponent />. One of the other advantages of the <Document /> component is that it provides a property to it’s children called putDocument() that allows you to update the state of your document, just as you might when using setState(). This method eagerly updates the component’s properties, and then ensures that the document is updated in PouchDB. As an added bonus, if you’re syncing your PouchDB database to a remote CouchDB instance, the <Document /> component will update properties when change events occur. This means that you can sync down remote updates with little effort in near real time. There is a working example in the GitHub repository under the ./example/ directory. It has it’s own README and is really easy to spin up and start playing. You can check out the example app over on glitch. This example app showcases several different ways to leverage a document including <Document /> and a higher order function withDocument(). From there the README is your friend! This library is intended to quickly get a PouchDB database into your react application. It won’t work for every situation and there are definitely more complicated use cases that it does not cover, but as a starting point it should get you off the ground quickly. It’s also worth noting that this library is not intended to work with other state container libraries. Maybe it does, but that’ll be purely by chance. If you are using something like redux you should consider taking a look at redux-pouchdb. Please reach out with feedback! I love questions and suggestions so send them my way. Stay tuned, I have some more PouchDB related goodies coming. Author’s Note: I originally wrote this during the government shutdown earlier this year, but thankfully that’s now over and I can maintain my streak of not writing about politics. Budgeting is an exercise in compromise. Compromise is the right way to view it because unless you are really wealthy you never quite have enough money to buy and consume everything you want. Or at least, if you’re like me you don’t. I’m sure somewhere out there is a perfectly content person who isn’t filthy rich and has everything they want - but that’s not me. I constantly find myself thinking things like: wouldn’t it be great to have a new iPad? Just because I want something though, does not mean I buy it. I have bills to pay, mouths to feed and other commitments that all force me to make a compromise, at least for this month. Let’s take a look at an example of everyday compromise in budgeting: let’s buy a car with financing. Before you sit down to sign the paper to buy a car you have to pick one out. Often you pick one out off of a lot. Your choices are limited by what’s available at that particular dealership. You may decide to buy the blue car that doesn’t have the sun roof over the red one that does because you like blue better. That’s a compromise. When you do sit down to finance it you have choices: a 3, 5 or even an 8 year car loan. Each requires a different amount of money paid for a downpayment and each will require a different amount of money monthly. As you continue the cycle of evaluating your options you are making more compromises, trading one thing for another in the hopes of reaching the ultimate goal: driving away with a new car. Maybe the compromises are big ones like, “This car is too expensive. I need to go get the gray car without the leather trim, instead,” thus blowing up the whole process and starting over. Or maybe the compromises are more subtle, like cancelling your satellite TV subscription in favor of over the air channels to free up more money in your monthly budget to pay for your car loan. Every decision, every step somehow involves a compromise. Money and goods are in limited supply, and so you’re constantly making tradeoffs between what you have, what you need and what you want. I’ll buy that new chair for my office today rather than the Nintendo Switch I’ve been coveting because I have a limited amount of funds available. I value a comfortable chair I use every day over playing Mario Kart. In my ideal world I’d have it all. No compromise would be required, and it’d be even better if I didn’t have to work for it either. That’s just not the world we live in. Everyone budgets, even if they don’t think they do. Maybe you don’t have a spreadsheet or fancy app to categorize and track your spending, but you’re still going through the budget process in your life. The loan example earlier is crude budgeting because it’s calculating a decision to spend funds. That’s really what budgeting is, calculating what to spend based upon compromises. When we attempt to budget without compromise, bad things tend to follow. We buy a car we can’t afford and we default, resulting in it being taken away from us. Or we don’t pay that credit card off fast enough and attempt to buy food and when we have no credit left we end up not able to feed our families. Compromise is ultimately the curb that hones in responsible purchasing decisions. That curb is based off of consequences, which are critical. They are the thing that gives us pause when we don’t want to compromise. Curbs are good, they keep cars on the road. Curbs provide the external boundaries for our path forward. This is the function of compromise, and our budget is really just that road we’re cruising down from month to month. Want to hear more budgeting banter? Check out Episode 25 of Life with a Twist of Lemon. A working example of what I’m going to describe here can be found at https://github.com/stanlemon/example-relay-app. For awhile GraphQL has looked interesting to me, like something I wanted to learn. I love the concept of strongly typing expressive queries that can be batched into a single request. That’s GraphQL, a technology that really seems to shine in UI work for single page apps (SPAs). Relay is Facebook’s GraphQL framework for React, it’s really where GraphQL got its traction from. I love React and spend a good portion of my hobby time building stuff with it, so GraphQL was a natural progression for me. The problem is that documentation and examples on how to use Relay are all over the place and it’s even harder to get into if don’t already have a working GraphQL server. Some might point out that Apollo is a much easier place to start with React & GraphQL and that definitely seems true, but I specifically wanted to familiarize myself with Relay. My first challenge was a working GraphQL server that I could issue queries against. Fortunately PostGraphile] makes this super easy. You need a Postgres instance to get going, but after that you have a working GraphQL server over top of a Postgres database. I won’t go into how to setup PostGraphile, it’s documentation is actually rather than good and there are some additional environment notes in the repository with my example code. Querying from within Relay is pretty easy and straightforward and the documentation that Facebook offers is adequate. If you want to play around with querying check out this GraphQL playground with Star Wars data, it’s pretty fantastic! GraphQL is not just for fetching data though, it also allows you to create, update and delete it. Those operations are called mutations and their documentation is a lot less clear. When I first got this working I naively expected the properties in the react component that came from this query to update, such that my new person would appear in my list. But alas it did not! Updating the state store for relay is not straight forward. The mutation documentation on relay’s site has some clues, but I ended up struggling to implement what I thought was a pretty straight forward user case: updating the list of nodes from my initial query with a new record. Make sure your createPerson() mutation is returning the same fields as your allPeople query, and also make sure that allPeople is returning id. Matching fields in the response is important for new records. If you’re only doing updates you can get away with returning just the fields you’ve changed, but the example below does not cover partial updates. The id field is not actually required for create mutations like this, but as soon as you start working with updates you’ll thank me as the the global graphql id is the easiest way to yank an existing record out of the store. What we need to do now is define an updater function on that the second parameter to commitMutation(). This updater receives a single parameter, the store and this is where we will do our handy work. Inside the updater function the first thing we want to do is get the portion of the store where allPeople is at, because this is what we need to modify. We need to put our new person into the list of person records in that part of the store, which will in turn trigger the update to our UI. This is actually pretty easy to do as long as you know the key to pass the get() method. I found this out using the replay-devtools, which I highly recommend installing. We also need to get the person record that our GraphQL server returned to us and then yank the payload from it. The payload in this case is that new person we created. Once this is done the local store in your react component will re-render with the new data. Keep in mind, this is a root level scenario for the component in question. It seems pretty simple, but good luck finding an example that works like this one. If you’re using data nested under another object (like comments on a post) than there are plenty of examples on the web more suited to that scenario, examples that involve things like the ConnectionHandler. In Episode 8 of Life with a Twist of Lemon my friend Jon asked me about buying a house and for part of that discussion we talked about mortgages. One of the things that I mentioned our family does is visualize our mortgage on a piece of paper hanging on the side of our refrigerator. 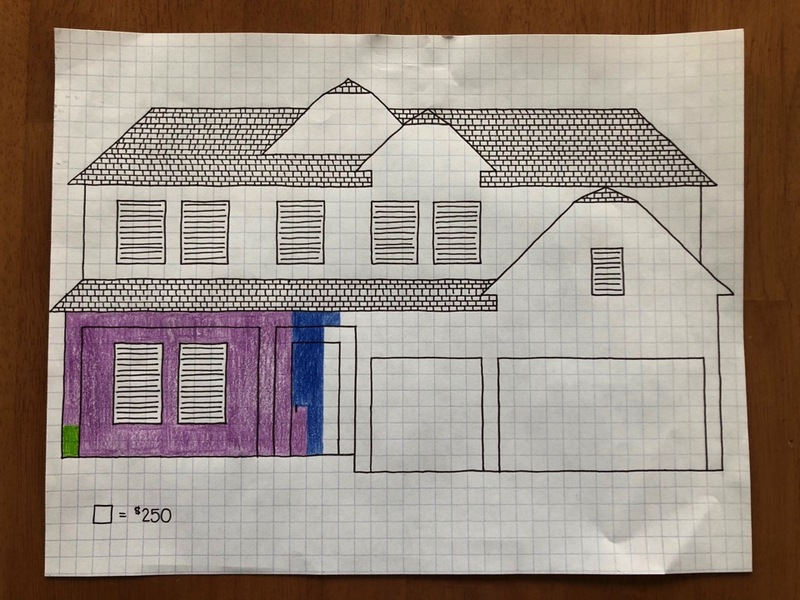 On the paper is a drawing of a house, which my lovely wife made to look like our actual house. It’s on graph paper and each square represents part of the mortgage we owe. As we pay down the mortgage we fill in boxes, with the ultimate goal of having the whole house filled in. This idea didn’t originate with me; I don’t actually even recall where I first saw this. I think it’s neat though, and I like that it’s there every day for us to see. A few listeners (it still amazes me that we have those, thank you mom and the other 3 folks that tuned in) asked me what that mortgage visualization looks like, so I thought I would share it here. The colors don’t mean anything, they were chosen based on the closest colored pencil at the time. The shaded parts (roof and windows) also don’t count in our drawing. Anyone can do this too, and you don’t need to be as fancy with the drawing as Mrs. Lemon was. That said, I think ours is pretty cool and I’m just tickled with what she made for our family. Now to fill it up! The purpose of the drawing and really a good portion of Jon’s and my discussion is understanding your debt and having a strategy to get rid of it. I don’t think debt is in and of itself a bad thing. In many instances it’s simply a necessity, like buying a house. I do think society is perhaps too comfortable with debt though and it’s good to go into something like a mortgage with a desire not to have it. That desire is strong in me, and things like this visualization help keep it top of mind so that I am constantly being reminded to get rid of it.